Wow. Christopher Nolan does it yet again. Interstellar was a roller coaster ride and an adrenaline rush that leaves you wanting more. Although it was almost three hours long and I wished Interstellar was longer because it goes by so quick. When the credits start rolling you won't want to be done. Christopher Nolan's visual effects will blow your mind and I can't forget about the musical score, either. It's an edge-of-your-seat thrill ride and without the music to build up intensity, scenes would not be as good. Matthew McConaughey plays Cooper, an old NASA space ship driver, now retired and working on his family farm. In the near future, Earth is dying and all of its crops with it. There are no more wars because nations are working together to find new ways to feed people. As the movie progresses, Cooper finds himself at a secret NASA facility where they're secretly planning on sending a team to space to find a new planet to live on. Along with Amelia (Anne Hatheway), Cooper leaves his family, including daughter Murph (Mackenzie Foy) behind to begin their search. She's also played as a middle adult by Jessica Chastain and older adult by Ellen Burstyn. While Cooper is gone, time passes faster on Earth, which is the reason for three different Murphs. 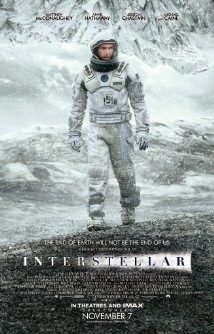 Interstellar is a movie for any science geek, sci-fi lover and Christopher Nolan fan. The ending has a mind boggling twist that makes you think through the entire film. It's still rattling my mind. Actors such as Matt Damon, Wes Bentley, Casey Affleck, and Topher Grace make an appearance as well and do a great job. I recommend watching Interstellar on IMAX because it is worth seeing on the biggest screen with the best sound.